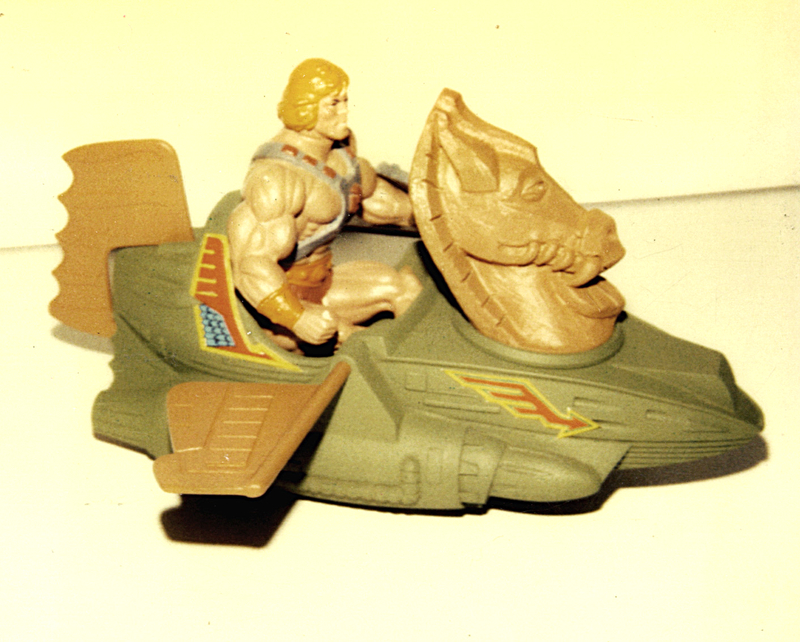 The Wind Raider, released with the initial wave of MOTU figures in 1982, was a perplexing vehicle. 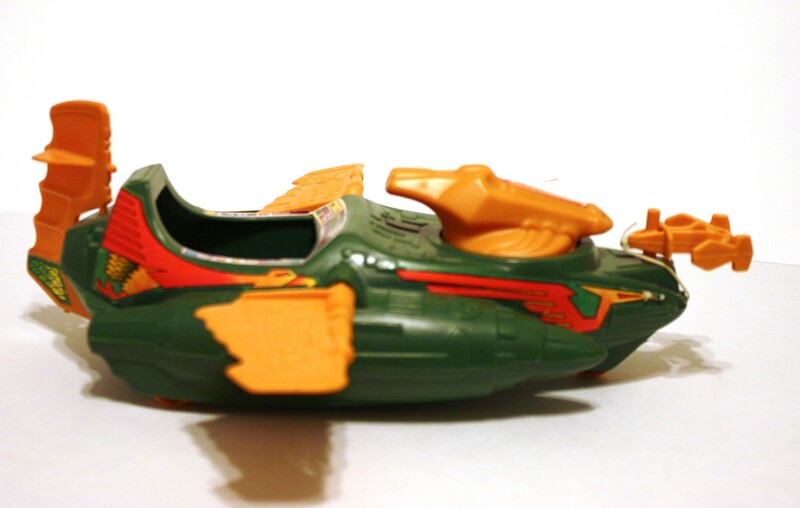 It looked a lot like a boat that had been given short wings. 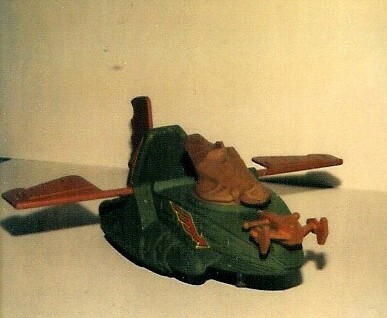 It even had an anchor, which my friends and I used as a rescue line (but which was intended, according to Rudy Obrero, as a kind of “hook and destroy” weapon). 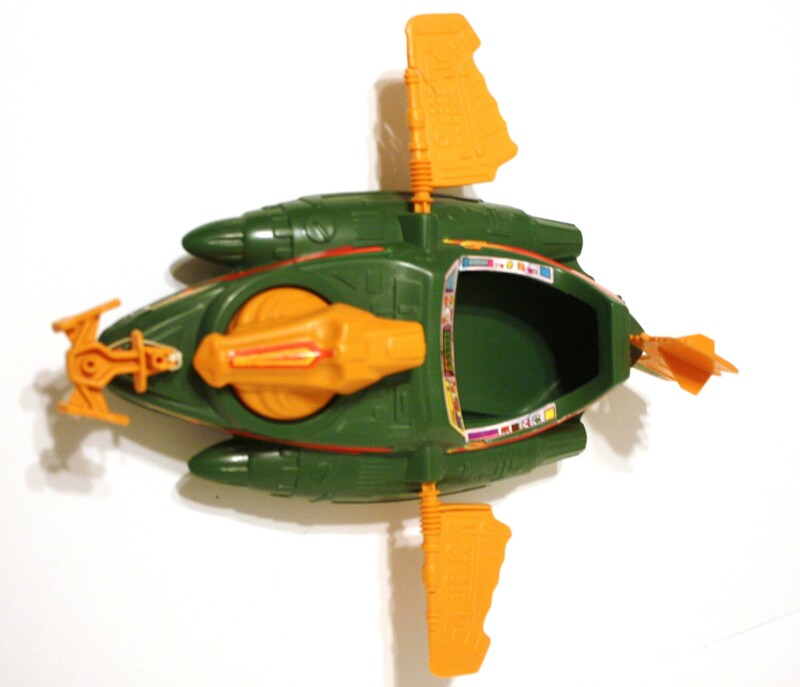 Indeed, it was originally designed to double as a watercraft, but it was never portrayed that way in any published media, so as kids we had to come up with our own theories about why it seemed to have a nautical theme. 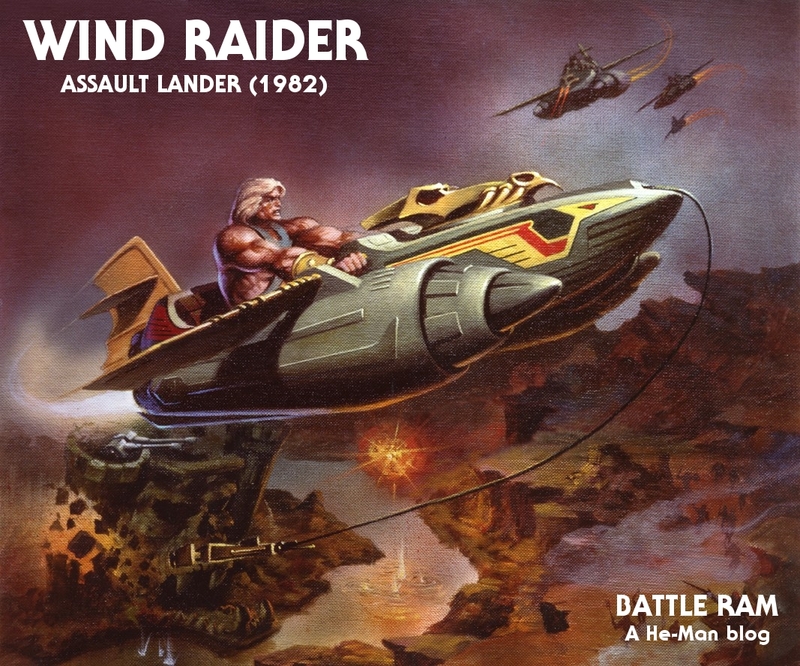 As I mentioned earlier, the Wind Raider was actually intended to work as both a boat and an aircraft. 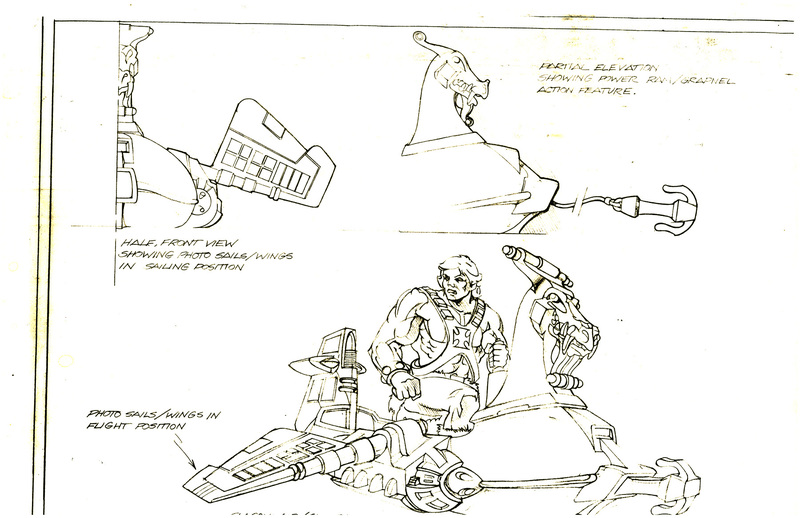 Although the vehicle was designed by Ted Mayer, Mark Taylor did some drawings that described some of the vehicle’s features. 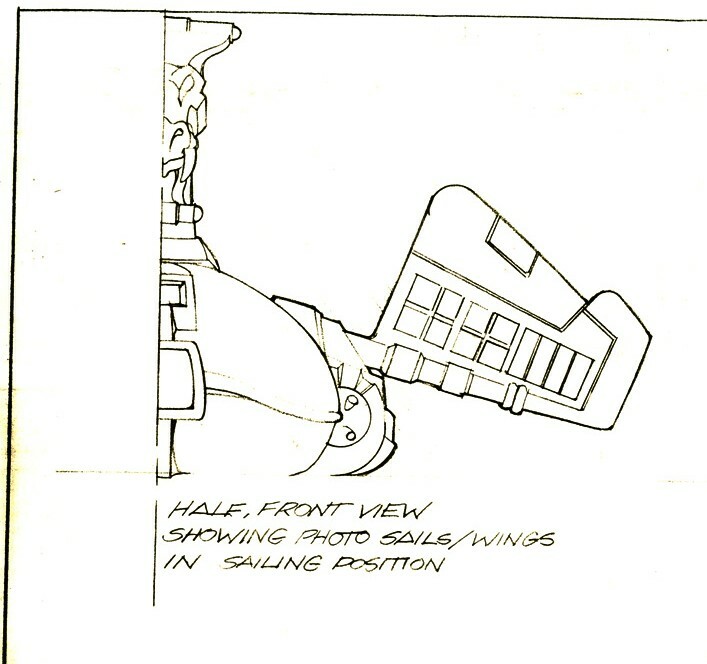 For instance, when on the water, the wings would rotate up and act as “photo sails”. The anchor is described as a “power ram/grapnel.” The dragon design bears strong resemblance to a Viking ship’s figurehead. Image courtesy of Ted Mayer. Artwork by Mark Taylor. Colorized version. 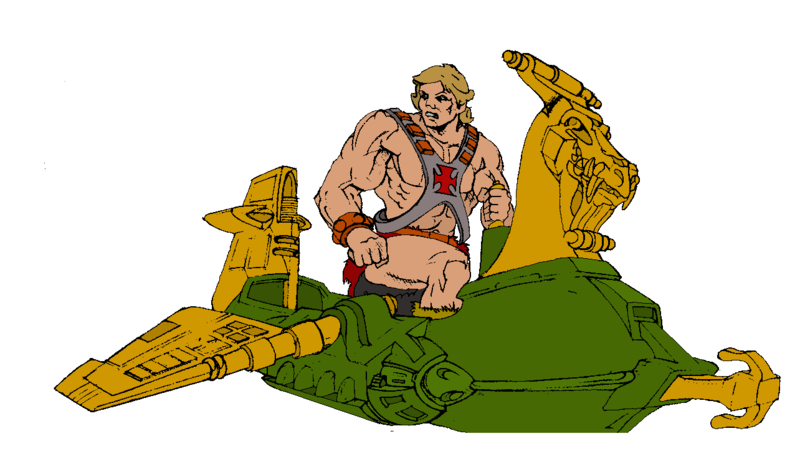 I chose colors for He-Man based on one of the early Mark Taylor B-sheet designs. 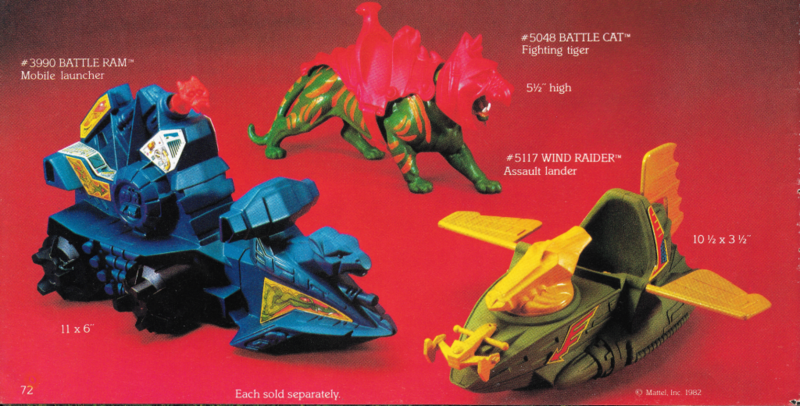 As was the case with the Battle Cat box art, the color for the Wind Raider gift set art appears to have been shifted and brightened on the mass-produced box. Either that, or the original oil paintings have become darker with age. 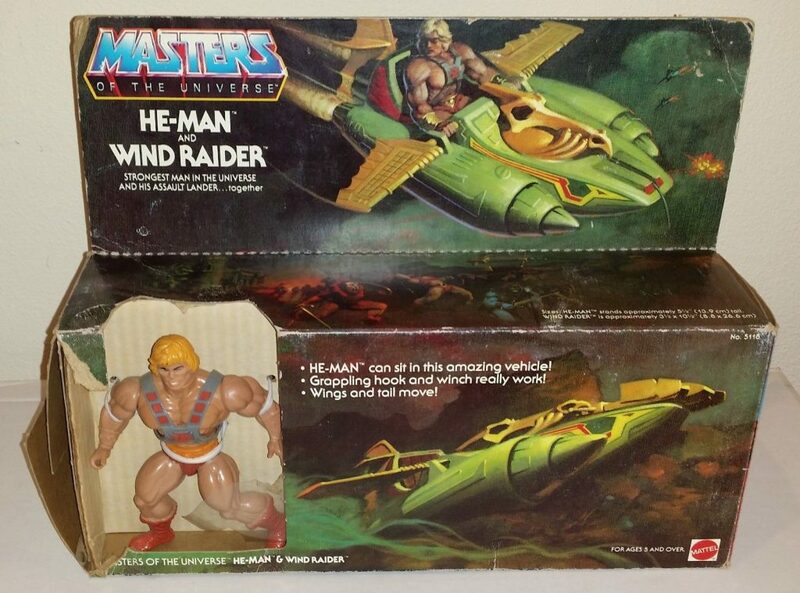 Interestingly, the first release of the He-Man/Wind Raider gift set described He-Man as the “strongest man in the universe“. 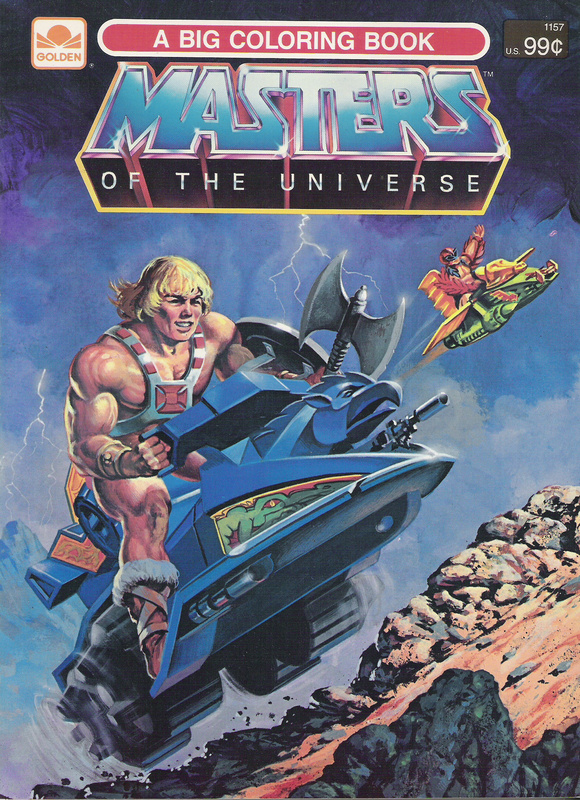 The reissue called him the “most powerful man in the universe” (hat tip: Tokyonever, curator at the Grayskull Museum website). Incidentally, if you want that original gift set now, you’re going to have to either hock your wedding ring or sell a kidney. 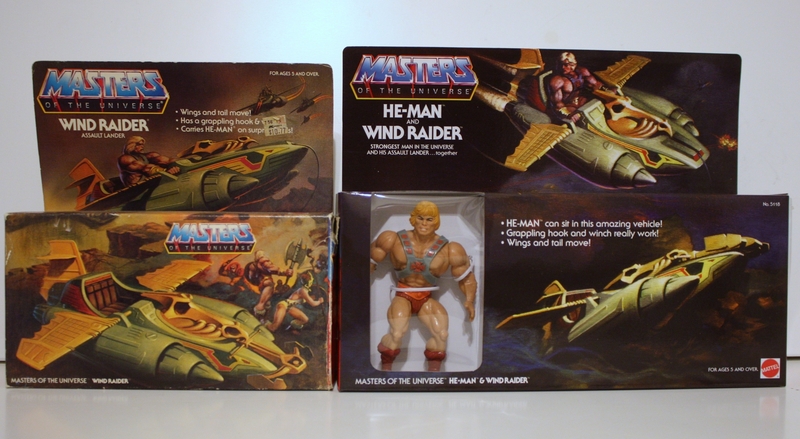 Personally I’ve been wanting to collect all of the Rudy Obrero boxes, and thankfully Tokyonever has contracted with a manufacturer and created replicas of the Wind Raider gift set box at a price that won’t result in medical problems down the road. 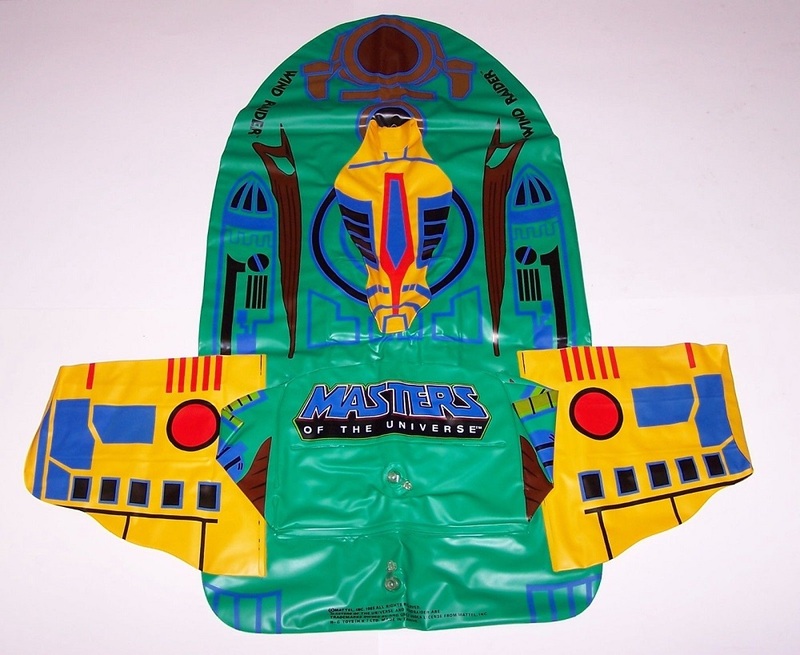 Don’t get any ideas about selling it as a vintage piece for a massive profit though. Tokyonever used the darker colors of the original oil painting, so there is no confusing the vintage item with the reproduction. 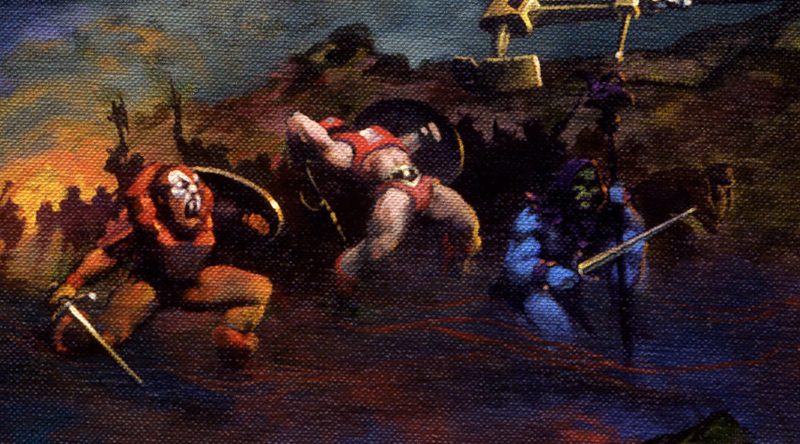 The warrior in the middle is often referred to as “The Warrior in Red” among fans and he’s considered something of a mystery. 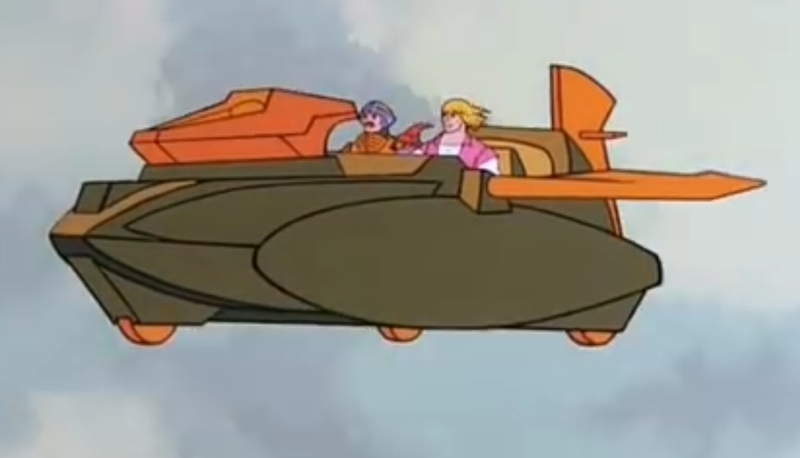 Personally, I think it’s just Zodac, slightly off model. 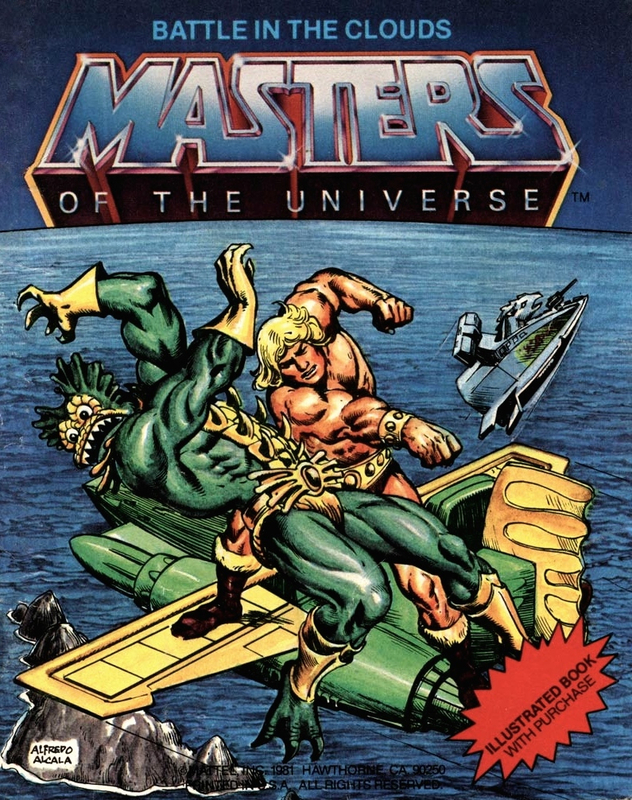 Sure, he’s got red boots instead of gray (notice Beast Man also has red boots), and he’s showing a bit too much belly, but I really think that’s Zodac. 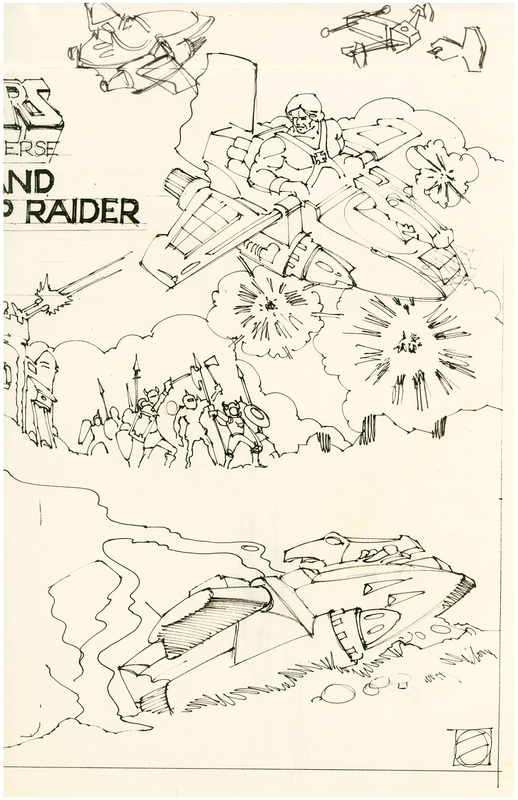 Although originally conceived by designer Mark Taylor as a heroic warrior, Zodac was marketed as an evil warrior. 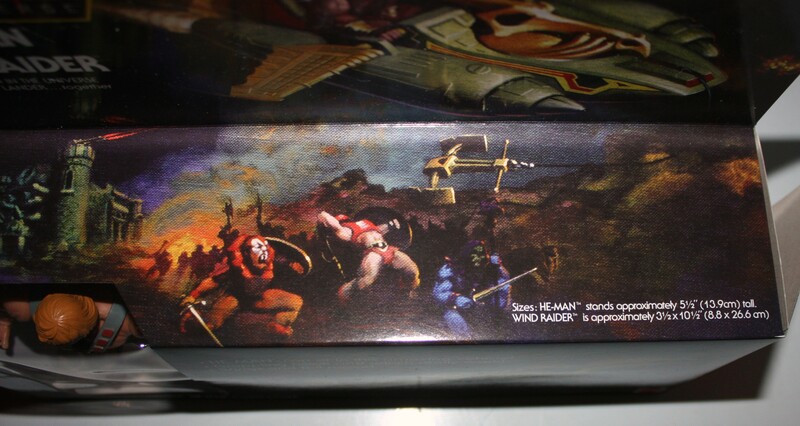 So it makes sense that he would be portrayed here among the bad guys. It looks like he got beaned by that anchor, too. Ouch. 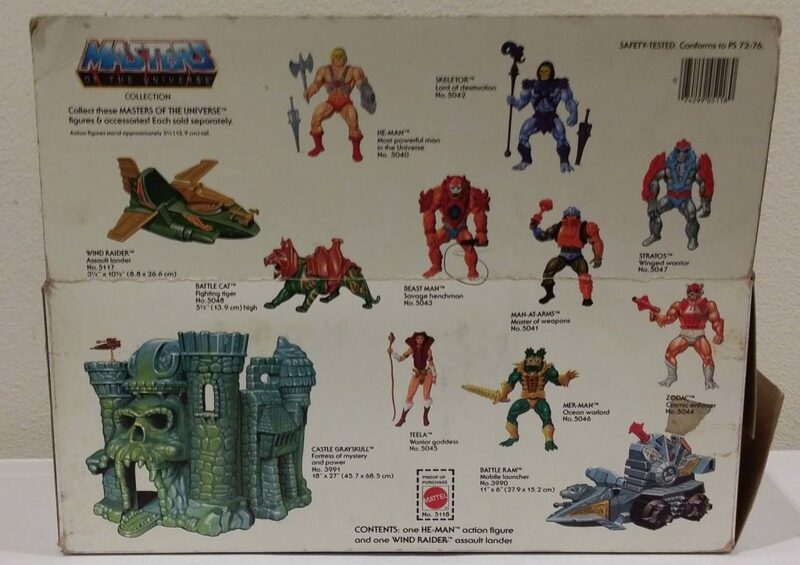 After having seen the sleeker version on the box art, the first time I saw the toy in person, I was just a little disappointed. 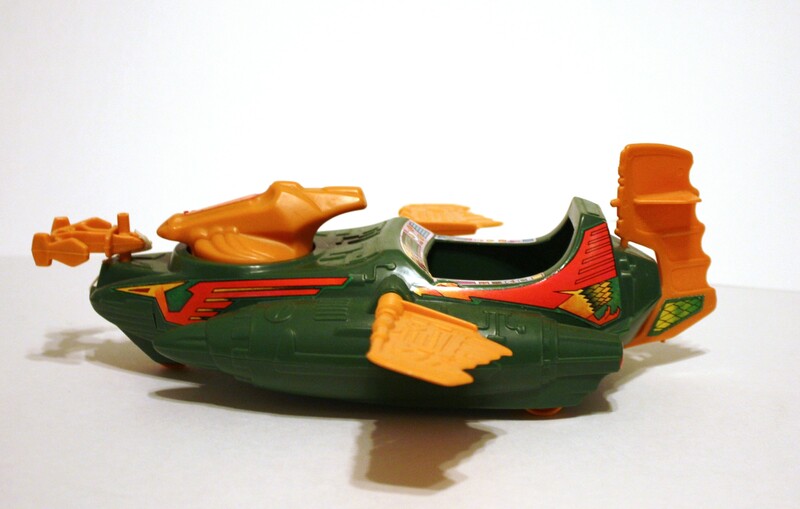 I actually quite like it today, but as a kid I thought the wings were too stubby. I think had the intent of the design (a hybrid water/aircraft) been explained to me, the size of the wings wouldn’t have bothered me. The overall vehicle was still very striking, though, and the anchor feature was a lot of fun. 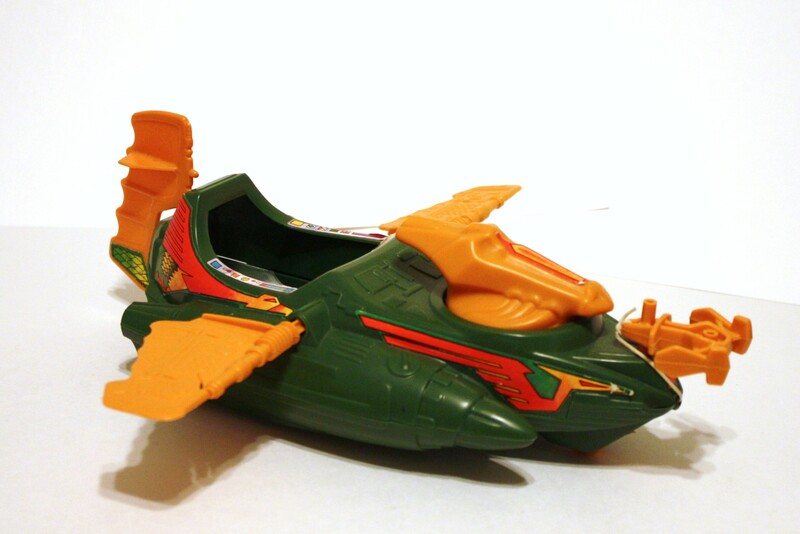 It was intended to be sold at a lower price point than the Battle Ram, and so was about 25% smaller in size. 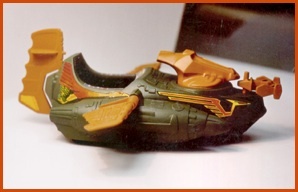 Even back then, the wings were fragile and would break off unless you were a very careful, conscientious child. 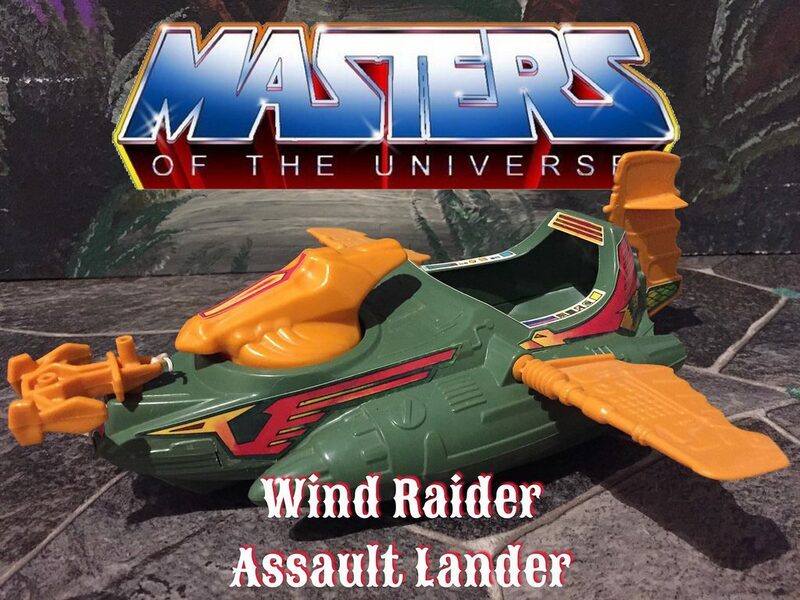 I did not have my own Wind Raider, but a friend who did broke his within the first few weeks. 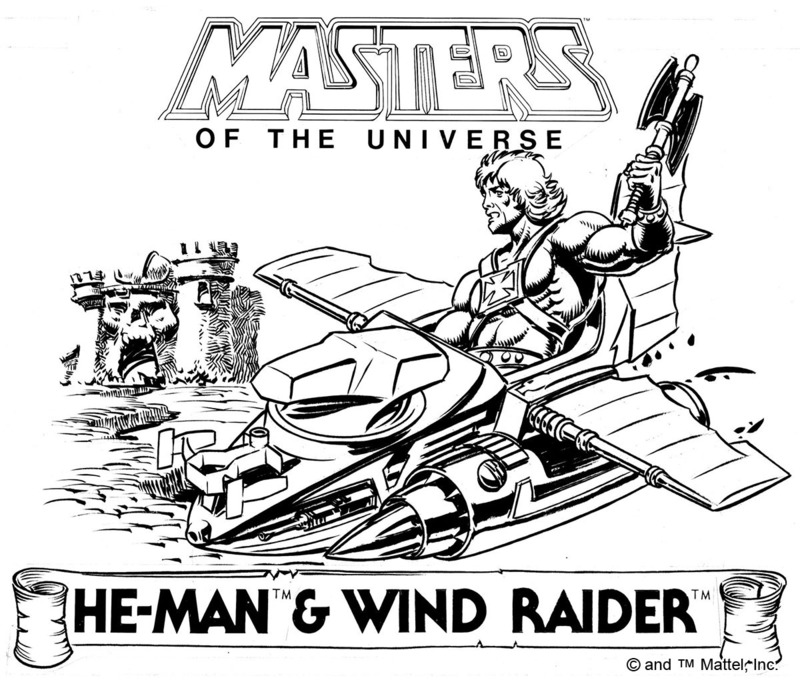 One of my favorite depictions of the Wind Raider is in the Alcala-drawn mini comic, Battle in the Clouds. 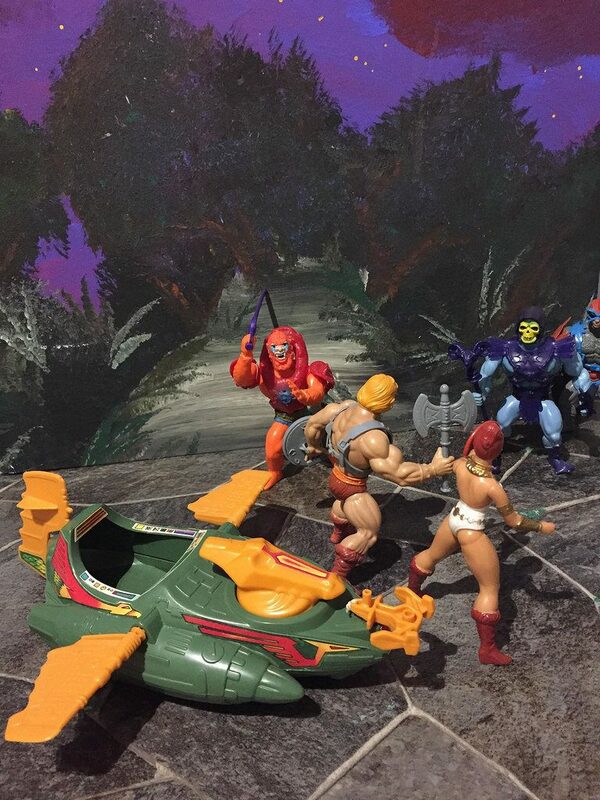 The Wind Raider seems to belong to Man-At-Arms and the Battle Ram seems to belong to He-Man. 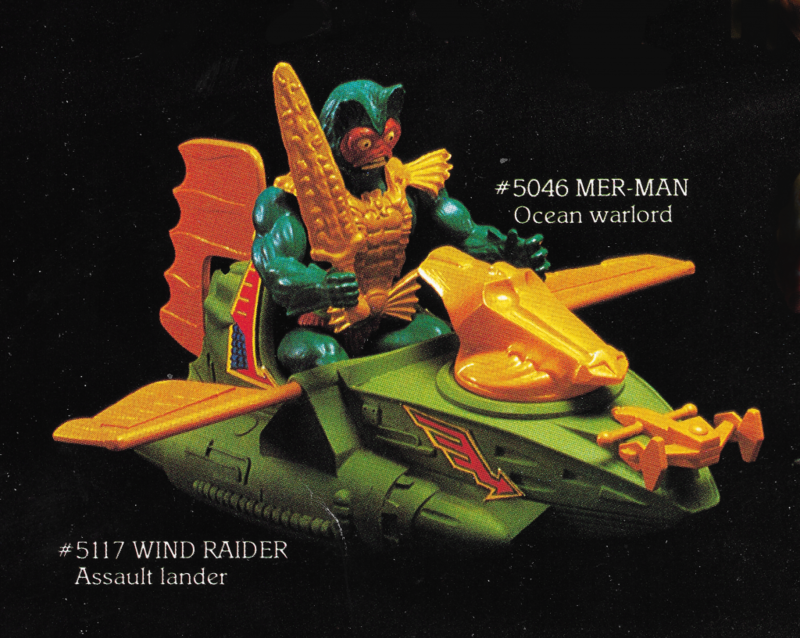 When the Battle Ram is stolen by Mer-Man, Man-at-Arms takes He-Man for a ride up a mountain, and makes a point to show off the Wind Raider’s superior thrust capabilities. 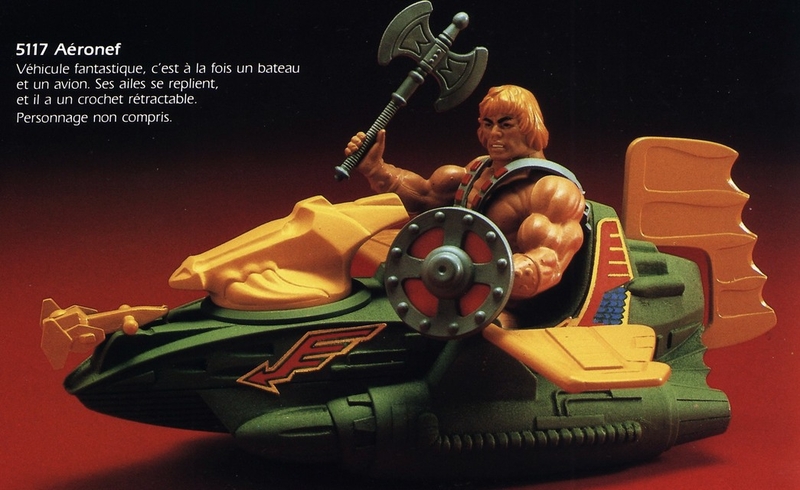 Even on post-apocalyptic Eternia, masculinity has everything to do with the amount of horsepower in your ride. Really enjoying your artucles! Are tokyonevers repros still available? Havent been able to get a hold of him. 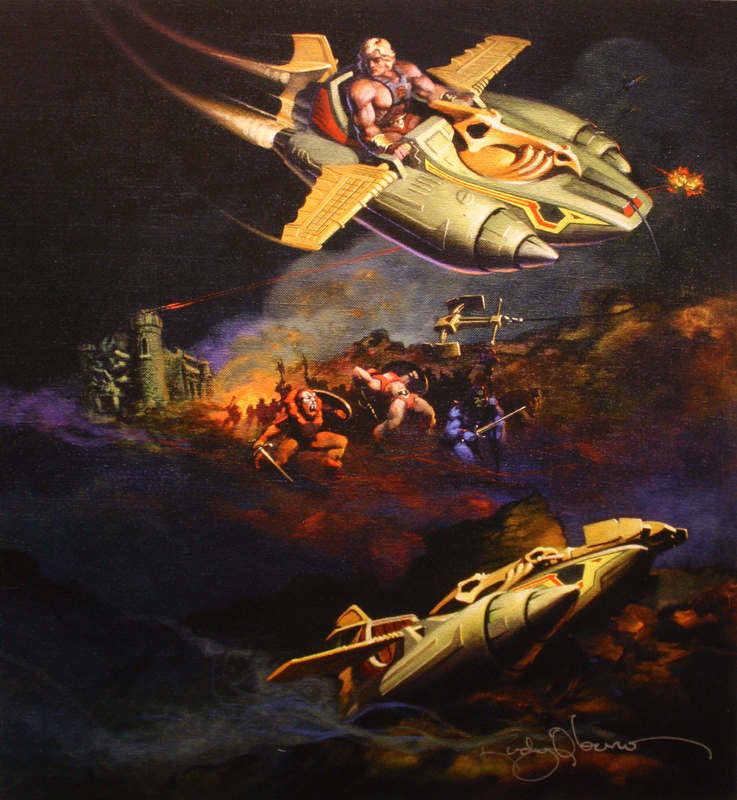 Hi Alexander, according to the artist, yes, he’s attacking Grayskull. 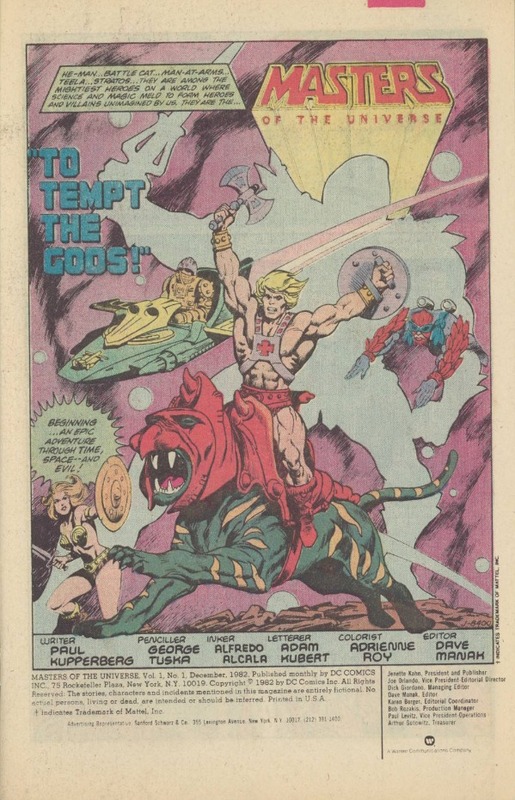 I’m basing some of this information from an interview with Rudy Obrero on the Roast Gooble Dinner podcast. 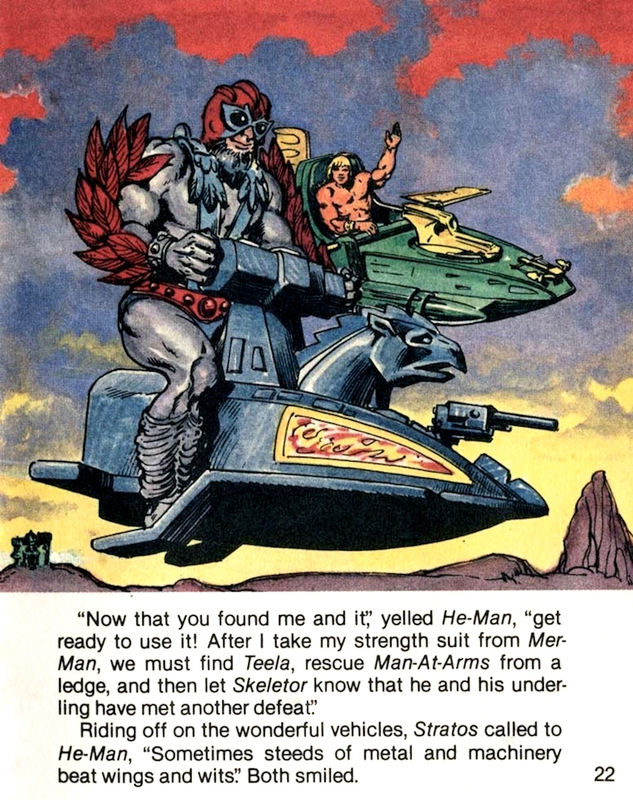 However, also keep in mind that Grayskull was originally supposed to be up for grabs to whoever could capture it, so it could belong to either He-Man or Skeletor, depending. 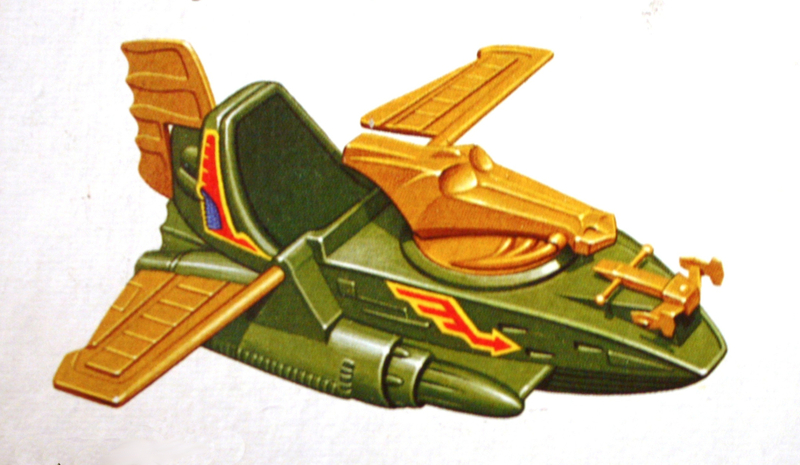 I never had the Wind Raider in my childhood collection (in fact, I had very few vehicles/creatures looking back), but the actual toy actually seems a bit flimsy to me, and when I did get one years later, the wings to me too looked too short and puny – they should have been far bigger to make it look more impressive. 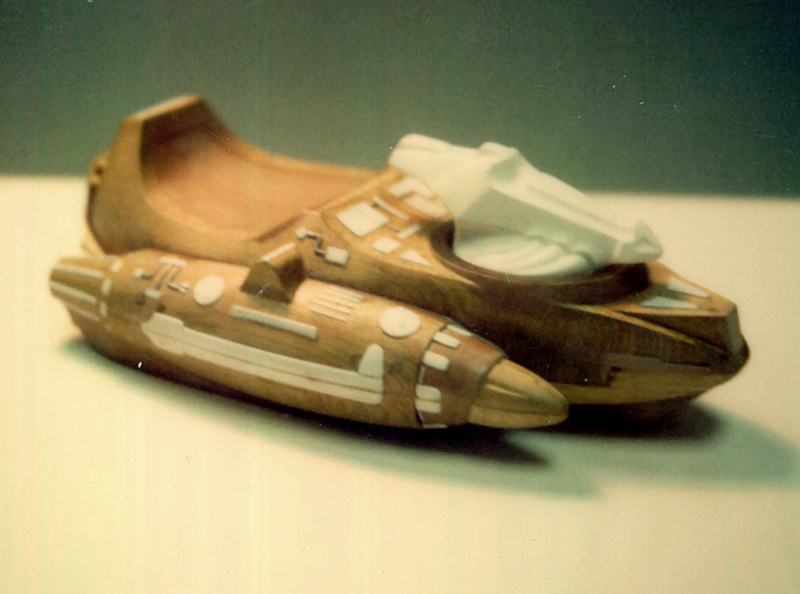 And the design of then simply cried “hey child, come and snap me off!”. 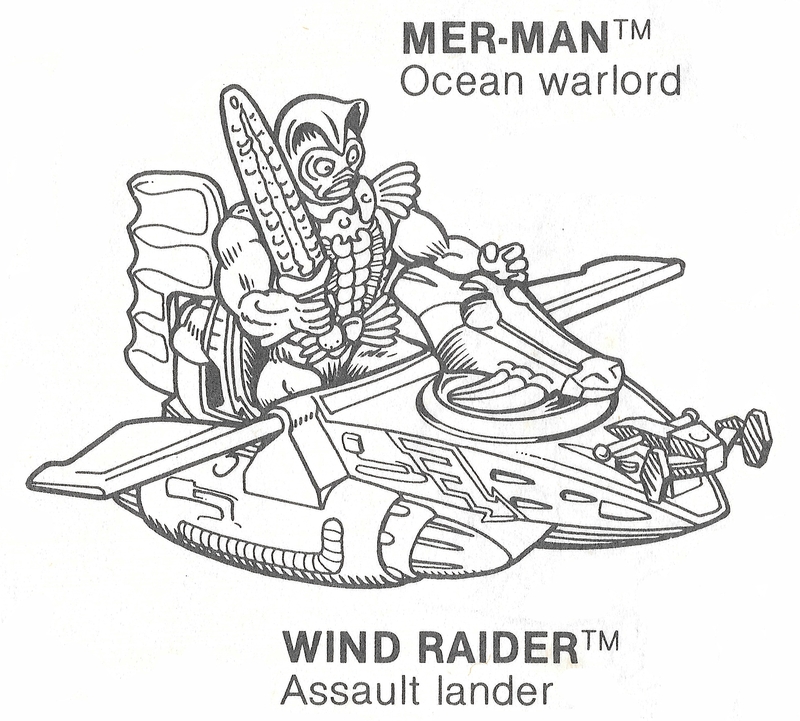 But the Wind Raider in terms of a vehicle and a concept I did like in the various MOTU literature. 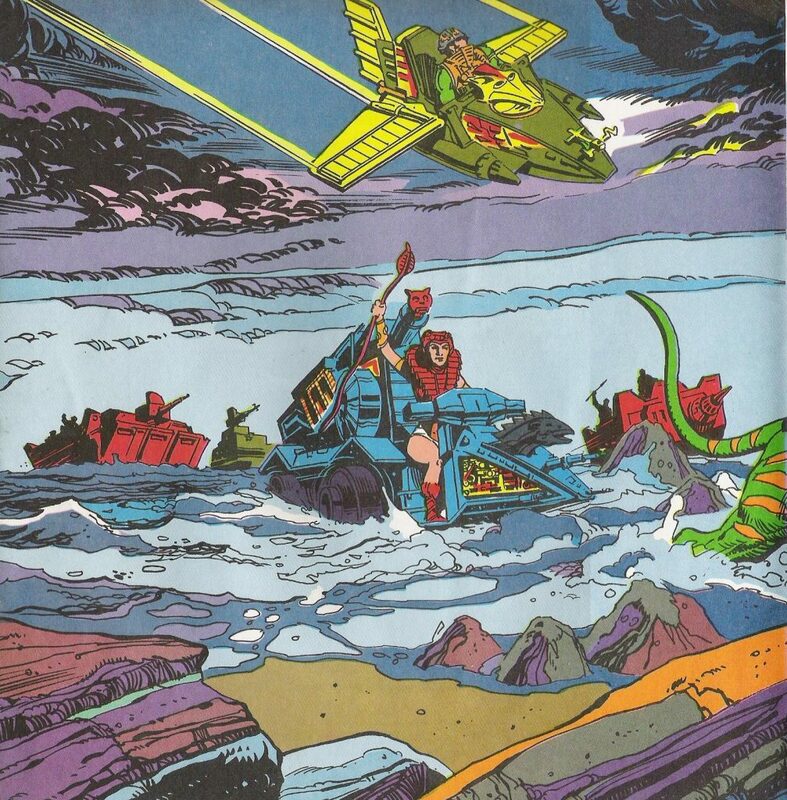 It’s boat-like look (I thought I was the only one who noticed this as a child) is indeed intriguing. 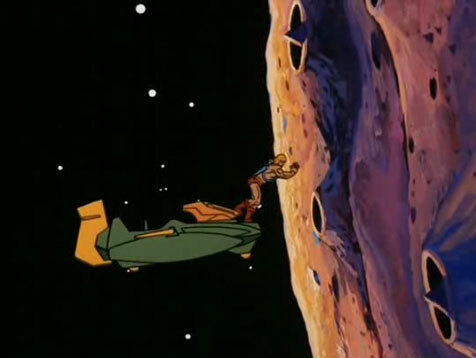 However I also felt that it had the appearance of what could be a vehicle that could be ‘sailed’ across the land, powered by the wind. 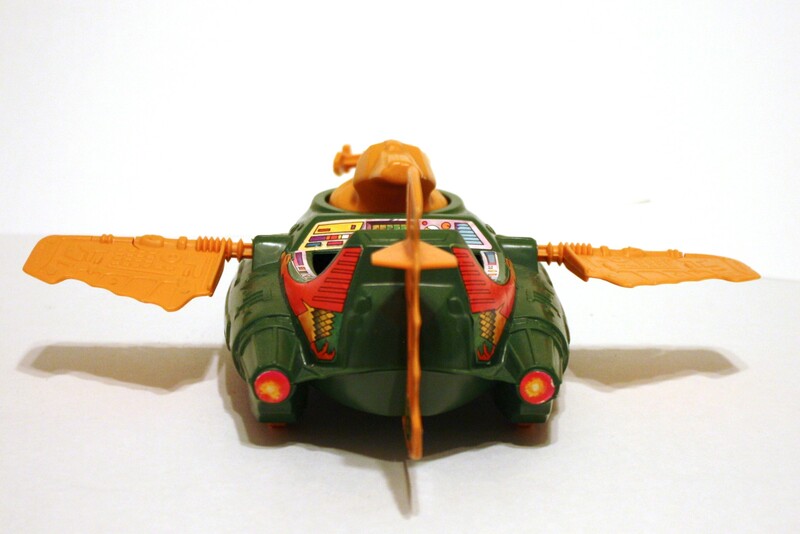 The pivotal tail fin and wings lead some credence to this notion. So say, if the pilot was stuck out in the middle of nowhere and they were low on fuel, they could ‘sail it’ home across the land. 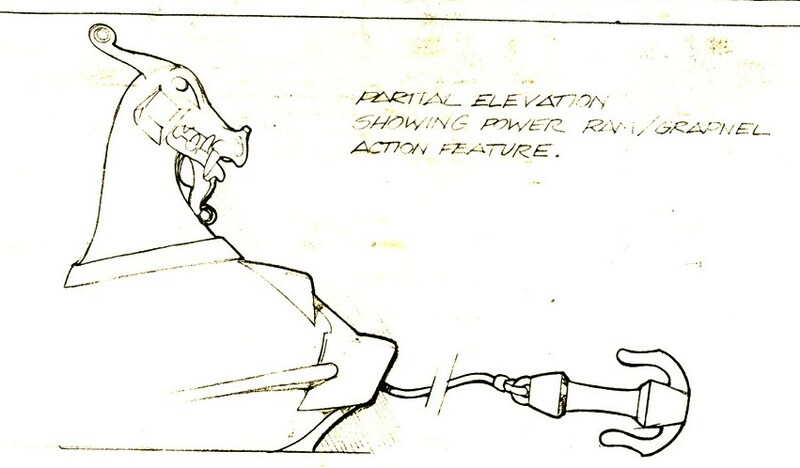 The wheels on the bottom allow this to be acted out play-wise, too. 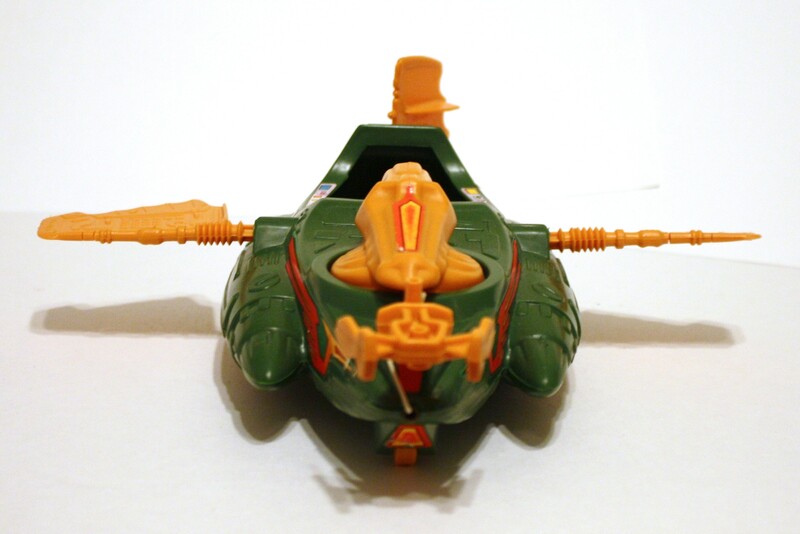 The colour scheme is good and I always felt that, even though it had various other pilots, it was Man-At-Arms’ vehicle by default, emphasised by their matching green-and-orange colour schemes. 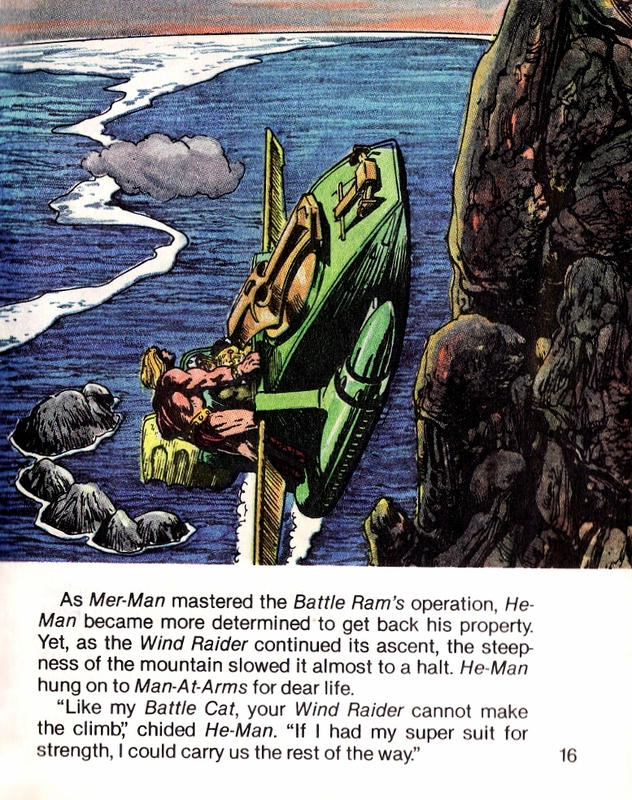 I always felt that Man-At-Arms had even constructed the Wind Raider himself (feasible, considering the things he was shown to have invented in the Filmation series, including the Road Ripper); and the UK Ladybird book ‘A Trap for He-Man’ also might vaguely suggest this, with some help from his little goblin engineers unique to the Ladybird books. 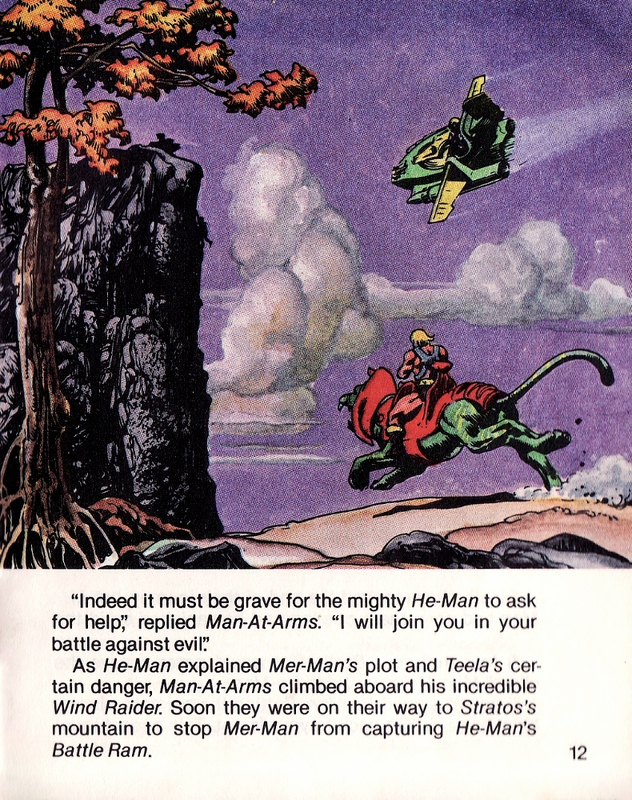 It’s interesting to see just how much in illustrative and merchandise shots, Mer Man is shown to be the pilot, long after it had generally been established as a Heroic vehicle. (Although, as we know, the whole ‘Heroic/Evil’ designations was often very blurry, until the third wave). 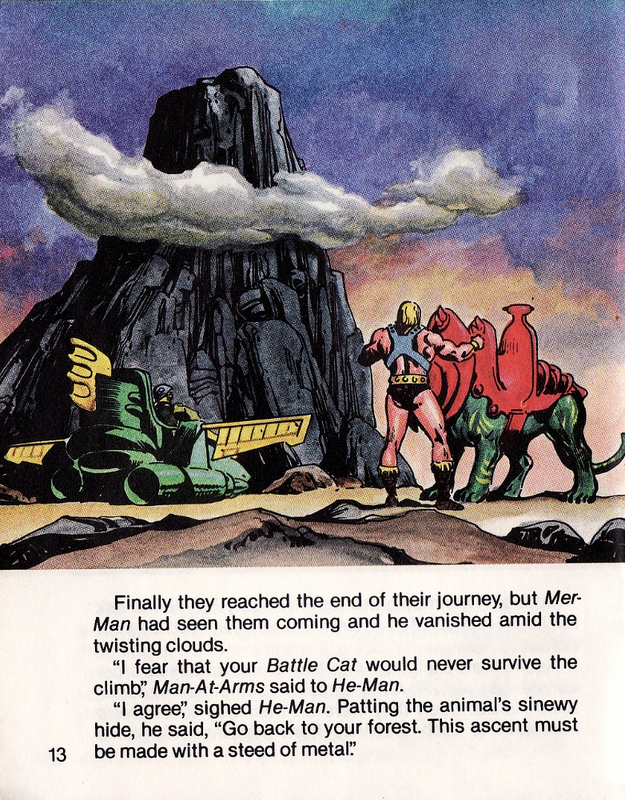 I also think it makes sense as Man-At-Arms’ vehicle, given the color scheme and also the story from Battle In the Clouds. In actuality though I usually have MAA driving the Battle Ram, because his colors are a nice contrast to the slate blue. 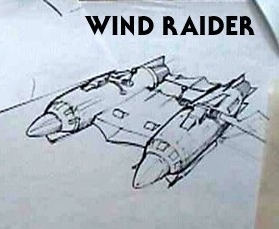 Mark Taylor once said that he thought of the Wind Raider as belonging to Stratos.